It’s this year’s Open Video Conference (OVC) in NYC this weekend. “Open video is the movement to promote free expression and innovation in online video.” I was there last year and it was a great event, very relevant to my work, and this year’s lineup is no less strong. There are two projects on the programme which I’m particularly interested in. There’s a workshop on Popcorn.js – an open HTML5 platform, created by Mozilla’s Web Made Movies team, which allows producers to relate video to other web data – which I’m going to be working with this Autumn. The Popcorn project has really moved on since the Beta version I mentioned here last year. They’ve built Butter now, an authoring tool to make Popcorn accessible, and producers have created a number of demos that explore its potential. 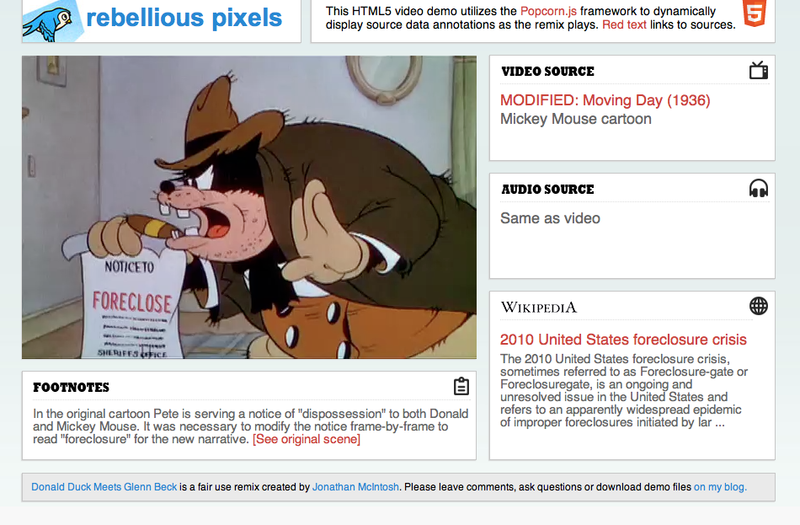 Rebellious Pixels make perfect use of Popcorn as an annotation engine, to reveal the sources of the content in this brilliant Donald Duck remix. In Happy World, it’s used to provide additional context and information to a documentary about the Burmese Junta. In a rougher state, but tantalising for its documentary potential, is a proof of concept for 18DaysinEgypt, the crowd-sourced documentary that’s being made from the media that people produced during the revolution in Egypt back in January / February of this year. The 18Days team have used Popcorn to create overlays offering details within a shot, which they have tested on footage of a demonstration, and it looks like a very powerful way of depicting the dynamics of those unfolding events. And there’s more Popcorn in the pipeline. Kat Cizek described to me in her recent interview how the Highrise team are using it to offer footnotes and semantic references within a 3D animated environment on their latest sub-project The Millionth Tower. Over the last few months I’ve been gathering video contributions from collaborators for The Are you happy? project and there are quite a collection now – from Serbia, Scotland, Maharastra, Tasmania and elsewhere. Do take a look at the project gallery and the Vimeo group. The sequences are fascinating, and feel like micro-portraits of the places they come from. Taken together they raise lots of questions about happiness, and point up the interview as a social construct, with the interviewer’s style, and the context – Ugandan market, Bristol fashion school, Mongolian capital city square – clearly playing a big part in the kind of things that get said. This Autumn I’ll be looking at how I can use Popcorn to inform and add other layers of meaning to this content. I want to see how contextual data combines with the video, and try creating some annotations. What really interests me is how web data can be used in a poetic way, creating a montage effect which with live data will be dynamic. Right now I’m wondering what kinds of data and annotation might work in this way – happiness indices? news feeds? weather info? poetry? psychology? One reason I’m sorry to miss the Open Video Conference is that it would be an opportunity to knock these questions around with others who’ve been thinking about how Popcorn can work. If that’s you, or if these questions particularly interest you do please get in touch. Another ambitious project that will be showcased at the OVC is Zeega – “an open-source HTML5 platform for creating interactive documentaries and inventing new forms of storytelling. Zeega will make it easy to collaboratively produce, curate and publish participatory multimedia projects online, on mobile devices and in physical spaces.” Zeega first got a mention here last year when it was very early days for the project. It’s being developed by Kara Oelher, Jesse Shapins and James Burns, the team behind Mapping Main Street, and they’ve recently won a prestigious award which will support them in the next stages of the development. There’s an interview on the Open Video Conference site about how Zeega is progressing, and an invitation to sign up if you’re interested in creating a Zeega pilot project. “Will video be woven into the fabric of the open web? Or will online video become a glorified TV-on-demand service? Open Video is a movement to promote free expression and innovation in online video through open standards, open source, and sharing.” These are the questions and the mission behind the OVC and the Conference is about building the policy, rights framework, technology and creative ideas that will support accessible and open web video. Tools like Zeega and Popcorn are really significant in that undertaking, allowing producers without coding skills to produce video projects for and of the web, so that we can begin to see what’s possible when the immersive world of video meets the network landscape of the web.